Here is a thoughtful letter from one of Herland Forest’s founding Guardians on why he chose to invest in this land stewardship cemetery. As I get older and contemplate what I will leave to those who survive me, I think about the Earth and what she needs. One of the ways I can leave a contribution is by making sure that my death and burial leave minimum impact. Another wasy is to actually have my burial preserve some land. Herland allows me to combine both of these goals into one act. The forest will survive and be protected as a cemetery. There may even be possibility of protecting more land if enough Guardians step forward to do so. I made a an investment in Herland to put my money in line with my value of treating the Earth better. This is only a very small part of the daunting tasks that we all face in an era of climate change. It is a step that I say that I could take at this point in my life. 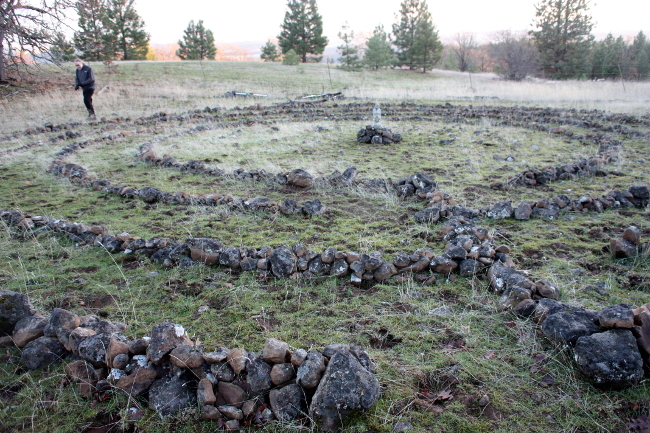 Walker meditating in Herland’s stone labyrinth.